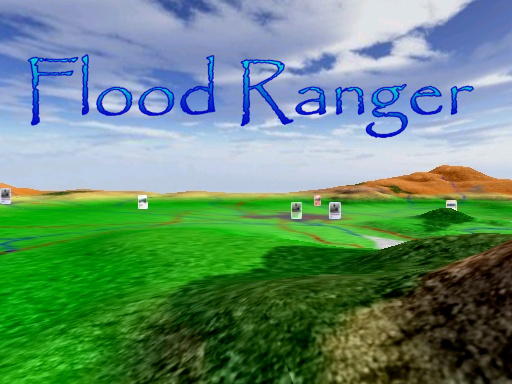 Welcome to Flood Ranger, the game that tests your strategic skills. You will have to anticipate the effects of climate change, meet the demands of different world models, and balance the needs of people and the environment by building flood defences, houses, businesses and infrastructure. The world you are about to enter is made up of and upland national park, with peat bogs moors and grassland. In the central area there is a large city, situated on an extensive river network and estuary. Around this are towns and villages embedded in an agricultural and wooded landscape, and along the coast you'll find tourists resorts, a port and some very beautiful saltmarshes and conservation areas. The game begins with two choices, the climate change and world futures scenarios. You will see the indicative flood plain, the map of flood risk, and the cost of building houses and flood defences in different areas shown on the left hand side, and the scoring bars for your performance on the right. At the bottom of the screen is the budget balance and instructions for each decade. Once you start, you will receive reports on how well you have done over the last decade and whether or not you have allowed people to become flooded, homeless or unemployed. Remember public opinion will determine whether or not you can keep your job. Good luck! 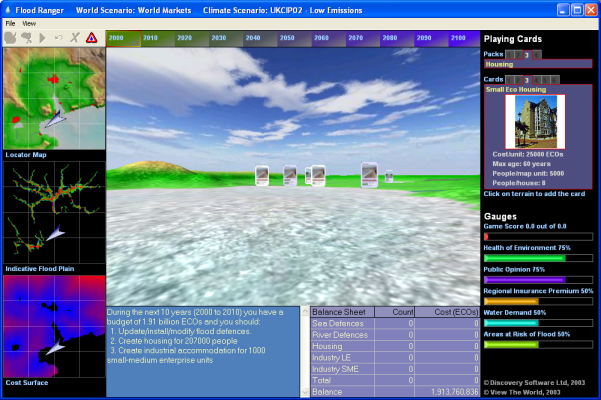 To start the game, click on the paint palette icon to select the World Scenario and then click on the cloud icon to select the Climate Change Scenario. The window includes the three-dimensional digital terrain map over which Flood Ranger can move (see overflight instructions). 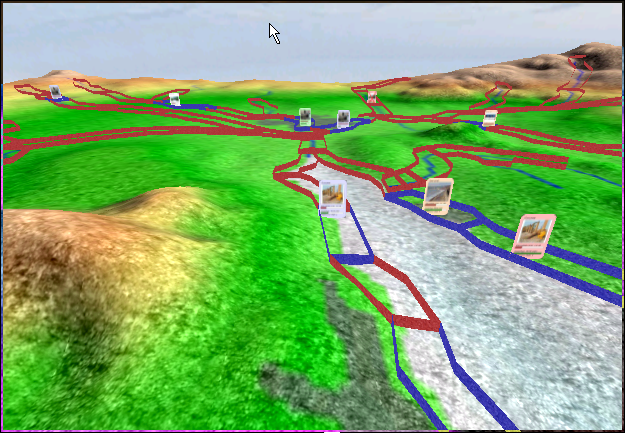 The virtual landscape in Flood Ranger is described several overlays. Under the View menu, you can select which of these overlays you wish to see displayed across the terrain. overflight instructions: to fly around the terrain use the arrow keys to move forwards, backwards and from side to side. Use the Page Up and Page Down keys to increase or decrease your elevation. The arrow keys in the NumPad area may be used to rotate your look angle left/right and up/down (N.B. on a laptop you will need to use equivalent keys on the QWERTY keyboard area by holding down the function key and pressing 4 for left, 6 for right, 8 for up and 2 for down). overlays: to show where different elements of the game are positioned a series of overlays are continually made available under the View menu. These include Elevation; Cities and Rivers; Cities, Rivers and Roads; Cities, Forests, SSSIs and National Park; Soils; Soils, Cities and Rivers; Soils, Cities, Forests, SSSIs and National Park; and All Overlays. The areal extent of cities changes as new elements are added. display options: to change the display options select options from the view menu. The form that appears lets you change the speed of movement across the landscape, the size of the cards as they appear on the landscape and their orientation in respect to your view, your viewing height above the terrain, your field-of-view (similar to a camera's field-of-view), and the vertical exaggeration of the landscape. Two additional options allow you to display the number of frames that your computer is drawing per second and to draw arrows above each new card that is added to the game for the current decade. The aim of Flood Ranger is to manage the risk of flooding in response to climate change and the demands of different world scenarios. To help the Flood Ranger there are two types of defences: sea defences and river defences. river defences: There are seven types of river defences including: small and large weirs, locks, dykes, river walls, demountables and reservoirs. An additional defence is that of the tidal barrier which is a special case, classified within river defences but also providing defence against coastal flooding events. N.B. In the game, when a tidal barrier is added, river and sea walls are also updated along downstream stretches of the river and the two neighbouring coastal stretches in the estuary. To add a defence to the virtual landscape you must select a card from those available in the upper-right corner of the game window. 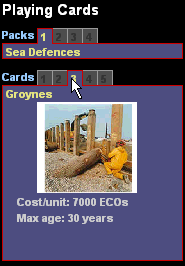 Move your cursor over the 'pack' heading to select cards from four different groups: Sea Defences, River Defences, Housing, and Industry. Similarly, once you have chosen a pack, move your cursor over the numbers available to highlight the card you require. To add it into the game click on the picture, which is then highlighted with a red border. You must then position the card on the terrain. A cost surface is shown in the bottom-left corner of the window. This helps you position your card. As you move your cursor across the landscape you will notice a target marker drawn upon the cost surface corresponding to the cursor's position within the overall map of the area. The colour of the cost surface indicates the relative cost of building at any point in the map. Blue is relatively cheap while red is the most expensive. Black indicates that you cannot build at that location. Also as you move your cursor around the terrain the cursor displays (in text next to the arrow) the relative cost from the cost surface. A value of 1.0 is the cheapest. The maximum may be anything from 3 to 20 depending on the type of card selected. Once you have selected an area to add the card left-click on the terrain at that location. You can undo the card placement using the undo icon on the toolbar or delete it later (but only during the current decade of the game) using the delete icon . When not adding a card the image in the lower left corner displays the current flood risk given the defences that you have in place. If you have defences in place for a stretch of river or coastline then the pixels within that stretch will not be coloured and will appear black. 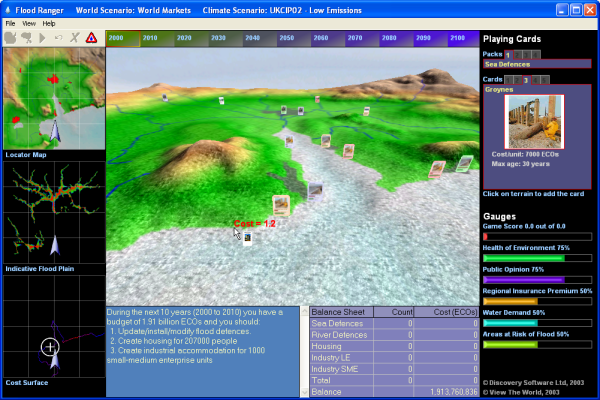 If your level of defences have degraded or have been purchased at < 1:100 for rivers or < 1:200 for coastal stretches then pixels to the outermost reaches of the flood plains will be coloured, indicating that floods will reach these areas if a future flood event is large enough to breach the defences currently in place (obviously all pixels within the floodplain extent of these areas will also be flooded. The idea of the game is to minimise the risk of flooding, so when playing the game you need to reduce the risk shown on this map particularly in or near urban areas. An important point to note is that any particular point in the landscape may be flooded from more than one source location. For example, areas near to the confluence of two rivers may be flooded from the direction of either river and in order to defend such locations you will need to defend flooding events from both rivers. The major city in the centre of the landscape is a good example of this and the flood risk map will not turn black unless all sources of possible flooding are defended against. Each river and coast is divided into management sections (or stretches). These can be seen on the terrain by clicking on the warning icon on the toolbar. The level of defences are shown as 'walls' on the terrain delimiting the each management area. If a wall is coloured red then it is not currently defended, conversely if it is coloured blue then defences are in place. At the start of each decade, Flood Ranger issues a set of instructions regarding development and construction of flood defences in order to meet the demands of the selected world scenario. These are based on the projected increases in population and family unit size, changes in industry and enterprises and changes in visitor numbers, There are two key elements, depicted by sets of playing cards, to be manipulated: housing and industry. If insufficient houses or industrial developments of the right kind are built then the number of homeless and unemployed will rise and as a consequence public opinion will fall. housing: there are three types of small housing (cheap, standard and eco i.e. energy efficient and flood-proofed) and three types of large housing (cheap, standard and eco). Under the local stewardship scenario there is a demand for larger houses to reflect the growing numbers of multi-generational family units, whilst in the world markets scenario the trend is the opposite. Eco housing has the benefit of reduced insurance premiums. The different housing types have different life expectancies. industry: three types of industry card are available to meet the demands of the economy; small and medium sized enterprises (SME), large industry and port development with different investment costs and life expectancies. Browser-based HTML Help. Published by chm2web software.